70 Jesus answered them, Have not I chosen you twelve, and one of you is a devil? Лк 6, 13. 13 Ye call me Master and Lord: and ye say well; for so I am. 1 Кор 8, 6. 1 Кор 12, 3. Флп 2, 11. 16 Verily, verily, I say unto you, The servant is not greater than his lord; neither he that is sent greater than he that sent him. Мф 10, 24. Лк 6, 40. Ин 15, 20. 18 I speak not of you all: I know whom I have chosen: but that the scripture may be fulfilled, He that eateth bread with me hath lifted up his heel against me. Пс 40, 10. Деян 1, 16. 19 Now I tell you before it come, that, when it is come to pass, ye may believe that I am he. Ин 14, 29. 20 Verily, verily, I say unto you, He that receiveth whomsoever I send receiveth me; and he that receiveth me receiveth him that sent me. Мф 10, 40. Лк 10, 16. 21 When Jesus had thus said, he was troubled in spirit, and testified, and said, Verily, verily, I say unto you, that one of you shall betray me. Мф 26, 21. Мк 14, 18. Лк 22, 21. 12 While I was with them in the world, I kept them in thy name: those that thou gavest me I have kept, and none of them is lost, but the son of perdition; that the scripture might be fulfilled. Пс 108, 17, 8. Ин 18, 9. 16 Men and brethren, this scripture must needs have been fulfilled, which the Holy Ghost by the mouth of David spake before concerning Judas, which was guide to them that took Jesus. Пс 40, 10. Ин 13, 18. Ин 18, 3. 18 Now this man purchased a field with the reward of iniquity; and falling headlong, he burst asunder in the midst, and all his bowels gushed out. Мф 27, 5. 20 For it is written in the book of Psalms, Let his habitation be desolate, and let no man dwell therein: and his bishoprick let another take. Пс 68, 26. Пс 108, 8. As a city-dweller, with a «proletarian» psychology, Judas is an alien among the simple-hearted children of nature, who carry in their souls the blue of the Galilean lake, the beauty of Galilean flowers and the twinkling of the starry sky. The idea had been awakened early in him, working hard and single-mindedly, the dream, bordering on an obsession, of the kingdom of Israel, which in the eyes of devotees (Zealots) is the kingdom of God, begun by the Messiah here on earth. His heart burns with messianic zeal and is sick with nationalistic grief. He also knows the force and power of money. The spectacle of the nation’s destitution and oppression makes him a revolutionary, perhaps, thrusting him along the path of political terror, but also an «economic materialist» in his messianic socialism. But in the dark depths of his soul slithers the serpent of ambition and love of silver, base auri sacra fames. He knows how to manage money, so he is given charge of the, of course slender, purse of the community of the apostles. Money tempts him and he is in that sense a «thief», a lover of silver. But above all he is a messianic Jew, like many around him, a revolutionary, messianic Marxist, a «Bolshevik». The city has deprived him of the poetry of his soul, but awoken in him an acute sense of protest. Yet he suffers precisely from his very intellect, which his heart cannot calm, longing and thirsting as it does for love, and he grows faint in this impasse. But now there was no longer any room left for doubts: He is the Christ, the Son of the Living God. Yes, He is the Messiah, but not the kind of messiah about whom he, Judas, had his ideal, for the sake of which he went the way of betrayal. He did not want to work miracles for victory over His foes, although He still had His wonderworking power. He did not call legions of angels to His defence, but gave himself submissively into the hands of enemies, … Was Judas right in his idea of the messiah-king? And in the face of the suffering Lord this idea melts away, like a satanic insinuation, like blindness. … If Christ would not reveal Himself as messianic king, even in the face of mortal danger, in which he, Judas, had deliberately put Him, then who was He? 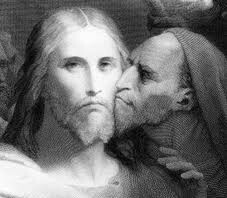 … That meant he was mistaken, had fallen into the delusion, which had led him towards betrayal, the blackest of black crimes, whose name for all ages is “the kiss of Judas”. He handed over to torture and death the Teacher, whom he did not cease to love even in that very betrayal. … That rebellious wilfulness, with which he wanted to put the Teacher’s path right, forcing Him to fulfil his will, vanished from him, replaced by unbearable pangs of conscience, hell on earth. Apostolic testimony about Jesus before the Old Testament Church — the act is not personal, but ecclesiastical. 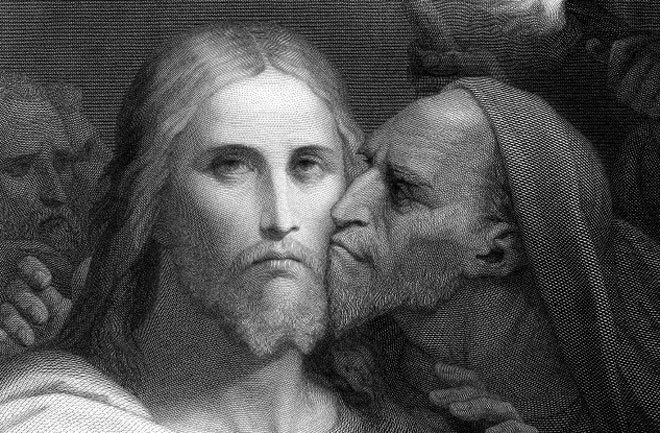 Why did Judas go again to the chief priests and the elders … ? <…> it was not enough simply to throw them far away from himself? The solemn return of the sliver pieces, accompanied by the confession: I have sinned in betraying innocent blood, was a rejection of his betrayal and condemnation of it before the representatives of the church hierarchy, in agreement with whom he had done his deed. It was, in addition, a condemnation of the old-testament church itself, which did not know its hour, and condemned the Righteous One, Innocent Blood, to death. This was a testimony, already too late for Judas, but apostolic in substance, about Jesus before the church, in a word, not a personal act, but an ecclesial one. Perhaps the most terrible and revolting thing is … Judas, who for the silver pieces has bought himself a house and set up his own business as a pig breeder and flower grower. May it never be! The traitor is looking for death with the Betrayed by him: would there be no cross for him with Him. But a lamb for the LORD “shall be without blemish” (Exo.12:5). … by this admission of his, Judas surrendered himself into the hands of Jesus’ enemies, as His faithful apostle, at the very time, when all the apostles deserted Him and ran away, and Peter had only just denied Him (in Mt. both tales stand immediately one after the other, begging comparison of the two: 26:69-75 and 27:3-5). Perhaps the high priests and scribes would arrest him too, who, although he had recently been their accomplice, had now become unnecessary for them, and put him in the dock with the Teacher, allowing him to taste death together with Him (as Peter had spoken at the supper, and now had just denied Him)? The betrayer sought death along with the One he had betrayed, he now tried to hand his own self over: would there be no cross for him with Him, as there was for one of the robbers?